The 19th Noorderlicht International Photofestival, Terra Cognita is a photography exhibition about the relationship between man and nature. How do we experience nature, and what is its value for us? Our romantic longing for pure nature is diametrically opposed to the practical desire to control the world and cultivate it. Terra Cognita looks at nature far away and close by, as a dream and as reality – nature in our genes, and in our minds. The series ALBEDO ZONE is comprised of black and white photographs of glacial ice and glacier water. They were made in Alaska, consistent with a scientific system that calculates the degree of reflection of solar energy from the terrain, a technique that is important to the study of climate change. This reflective capacity is termed ‘albedo’. Ice reflects warmth, whereas water absorbes it, a mechanism that strengthens warming effects. Bezzubov made silver gelatin prints, which gives the spaces a delicate beauty. Taylor De Cordoba is pleased to present All Gold Everything. An Elegy, a new series of paintings on paper by Los Angeles artist, Frohawk Two Feathers. The exhibition will run from September 8 – October 27, 2012 with an opening reception on Saturday, September 8th from 6 – 8PM. All gold. All gold anything. (x4) I want. I want everything. All gold. All gold anything. (x2) All gold. All gold everything. So begins Soulja Boy and Young L’s 2011 hip-hop hit “All Gold Everything.” And so ends the final chapter of Frohawk’s trilogy detailing the battles for and the eventual conquest of Hispaniola. Beginning in LA in 2011 and looping across the country to NY, Denver, and back to LA again, the story follows Andre Lafayette (a character loosely based on Toussaint L’Ouverture and Jean Jacques Dessalines) and his confederates as they eliminate (and co-opt) their former colonial masters, the Company Crocodile, and anyone who would stand in their way. In his typical complex fashion, Frohawk weaves layered and at times clashing stories of falsified, glorified, and rectified histories that draw upon various traditions and religions, forming connections across time and geographical space. cultural traditions results in a syncretism typical of Frohawk’s graphic interwoven tales. Works include “Let Me Upgrade Ya,” and “Most Young Kings (The Death of Andre I)” demonstrating the artist’s continuous vocal narrative and visual mix of all things current and past. Frohawk Two Feathers has exhibited internationally with shows in Miami, Berlin, Los Angeles, New York, Washington D.C. and Cape Town. His work is currently on view at the MCA Denver for his solo exhibition We Buy Gold, We Buy Everything, We Sell Souls. The artist has been featured in myriad publications including Art in America, Los Angeles Times, The New York Times, Flaunt, New American Paintings and The Huffington Post, among others. He lives and works in Los Angeles. Taylor De Cordoba is pleased to present Summer Sun, a group exhibition curated by LA-based artist Hadley Holliday including works by Pamela Jorden, Emily Newman, John Pearson and Tyler Vlahovich and Hadley Holliday. The exhibition will run from July 14 – August 18, 2012 with an opening reception on Saturday, July 14th from 6 – 8PM. In Los Angeles the sun is our constant companion. In summer it screams down from indigo skies commanding us Outside! Rejoice! Recent events have made angelenos more aware than ever of the sun’s presence. In May 2012, the strange twilight of an eclipse cast a lonely shadow over the city. A few weeks later a “little black spot on the sun” reminded us of the sun’s massive girth as Venus, a planet similar in size to the earth, appeared as a tiny speck traversing the sun’s surface.With the passing of the solstice, the days begin to shorten and yet in LA the temperature continues to rise. Contrast increases and shadows darken against the white light of the sun. Mirages transpose images of the sky onto the earth. Venturing into the cool of the gallery, these featured artists meld mystery, beauty, joy and fear into images of our quotidian experience sparkling in the summer sun. Hadley Holliday’s abstractions flood pigment against a geometric framework to create fluctuating radiant spaces. Pamela Jorden’s paintings contrast soft and hard, fluid and solid with a jubilant interaction of shape and pattern. Emily Newman’s videos explore imagination, legend and utopian aspirations in everyday life. John Pearson’s cyanotypes and videos are meditations on light and shadow, the process a direct translation of sunlight into image. Tyler Vlahovich’s high contrast paintings and idiosyncratic sculptures point to the ritual roots of mark-making. 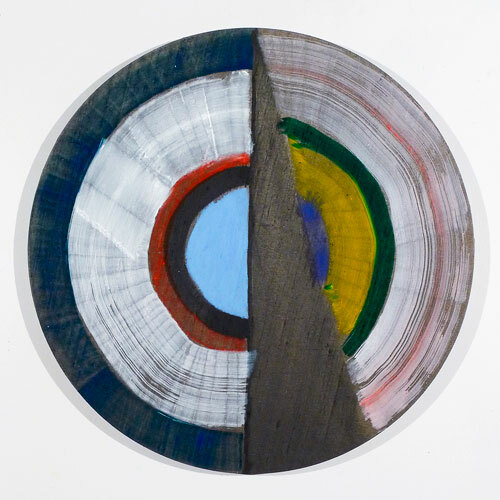 Taylor De Cordoba is located at 2660 S La Cienega Blvd in Los Angeles, CA and is open from Tuesday – Saturday,11am-5pm. For additional press information, contact Heather Taylor at heather@taylordecordoba.com or (310)559-9156. Gallery artist Timothy Hull is subject of an article by Ken Miller for Interview Magazine entitled Timothy Hull’s Brooklyn Is In Ruins. 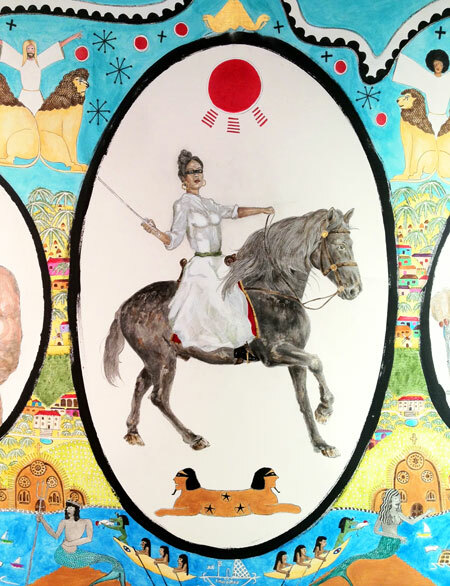 Gallery artist Frohawk Two Feathers is the subject of an article by Ana Holguin for The Idler entitled (Re)Inventing The Past. You are currently browsing the Taylor De Cordoba blog archives for August, 2012.